» Internet Governance: Is it finally time to drop the training wheels? The Internet just works, right? Over the last few decades we have come to accept that the Internet just works. Many also assume it is truly global and operating essentially without borders or centralised control. Those of us involved in the mechanics of making it work tend also to assume that it is controlled by the many bottom-up multi-stakeholder processes that routinely deliver Internet Protocol (IP) numbers[i], domain names and protocol identifiers when needed, through the many working groups that develop policy, protocols and processes pertaining to these key identifiers. While for the most part this is true, there is, however, one entity at the heart of this system: the Internet Assigned Numbers Authority (IANA) (iana.org), operated by the Internet Corporation for Assigned Names and Numbers (ICANN) (icann.org). That entity?s operation is governed by a service contract with the United States government through its National Telecommunications and Information Administration (NTIA). Via this contract with ICANN, the NTIA has explicit sign-off over the entries to IANA within the name space, and a degree of contractual influence over the numbering system (NTIA 2012). This is an overarching, or stewardship, role that operates in addition to those accountability measures embedded in the policy process and systems that exist today to create, allocate and record IP numbers, protocol identifiers and domain names. The key Internet identifiers have different and separate systems of creation and allocation at the day-to-day level. For IP numbers, the Regional Internet Registries (RIRs) (nro.org) allocate from the pool of IP numbers allocated to them by IANA to Internet Service Providers (ISPs) according to the rules established within both the RIRs themselves and at the overall level by the Internet Engineering Task Force (IETF) (ietf.org). The RIRs are member organisations, and each has its own policy working groups that determine the rules governing the allocation of IP numbers in an open and transparent manner. Protocol identifiers are created by technical working groups of the IETF that are open to anyone to participate in, with the technical merit of each determined by the collective expertise of the working group. As each technical protocol is defined, the requisite changes to IANA are stated and tracked. Once a protocol is approved, the specific parameters are entered into the IANA database; with the rapid change in technology, this can amount to thousands of entries each year. The naming system, however, is somewhat more complex, with two distinct sets of policy processes at work. In essence, there are two types of top level domains: generic top level domains (gTLDs), such as *.com and *.org, and country code domains (ccTLDs) such as *.au and *.nz. Apart from a number of historical top level domains, the gTLDs are generally subject to the policies established by the organisations operating the registries and conform to a registrar agreement in place with ICANN. For many ccTLDs the policies pertaining to the allocation of domain names are similarly developed by multi-stakeholder processes incorporating their own government?s participation, and with varying degrees of government oversight. For some country codes, however, governments control the domain absolutely, and conversely there are some which do not have any control or influence at all. In all of these circumstances, changes to the entries in IANA both for the country codes and the generic top level domains have to be signed off by the NTIA before they can be implemented. The RFC then went on to propose a list of initial allocations. As the protocols and networks expanded, the records pertaining to core network functions expanded similarly, and the set of Internet Protocol (IP) numbers, names and protocol identifiers expanded well beyond the notebook Jon Postel could keep in his pocket. This list eventually became the basis of the Internet Assigned Numbers Authority, and was later defined as: ?the technical team making and publishing assignments of Internet protocol technical parameters? (Carpenter et al 2000). Along with a group of Internet pioneers, Jon Postel was originally a graduate student at UCLA. In this capacity he was funded ? and the IANA work performed ? as an unwritten component of various US Department of Defense research projects (ICANN SSAC 2014). As the work grew, and more people became involved, the NWG evolved to become the Internet Engineering Task Force (IETF). The IETF took responsibility for the ongoing creation of RFCs and, more specifically, the allocation and procedures for assignment of IP numbers, names and protocol identifiers. Postel remained as editor-in-chief and record keeper of RFC assignments, and contributed significantly to many RFCs. IP addresses are allocated hierarchically, with the highest level allocations recorded by IANA. Below this level, the specific addresses were recorded separately from the key protocol identifiers. The Network Information Center (NIC) was established in 1970 as ?an ad hoc thing, with no specific directives from ARPA? (Meyer 1970) to record IP address allocations, and these remained in a stand-alone track of RFCs documenting their assignment until 1990. The day-to-day assignment of Internet numbers was officially assumed by the Defense Data Network - Network Information Center in 1987 under a US National Science Foundation contract. The third major component of IANA?s work emerged in the form of the domain name system, largely to support the delivery of email. In this component, the familiar ?name? forms of Internet addresses were encoded, and the rules around how individual computers could be addressed by name evolved. Once again, Jon Postel was at the heart of the foundational record keeping (Postel 1982). Thus we have the three essential parts of IANA: domain names, numbers, and protocol identifiers. The records were originally kept in an ad hoc fashion; however the increasing reliance on Internet systems, coupled with the commercialisation of Internet services that took place throughout the 1990s, meant there was a corresponding increase in the formalisation of relationships between the parties involved and the tasks undertaken. The first part of this formalisation took place within the IETF itself, and a number of RFCs were created that codified the relationship between IANA and the IETF, as well as the various rights and responsibilities of the entities involved. 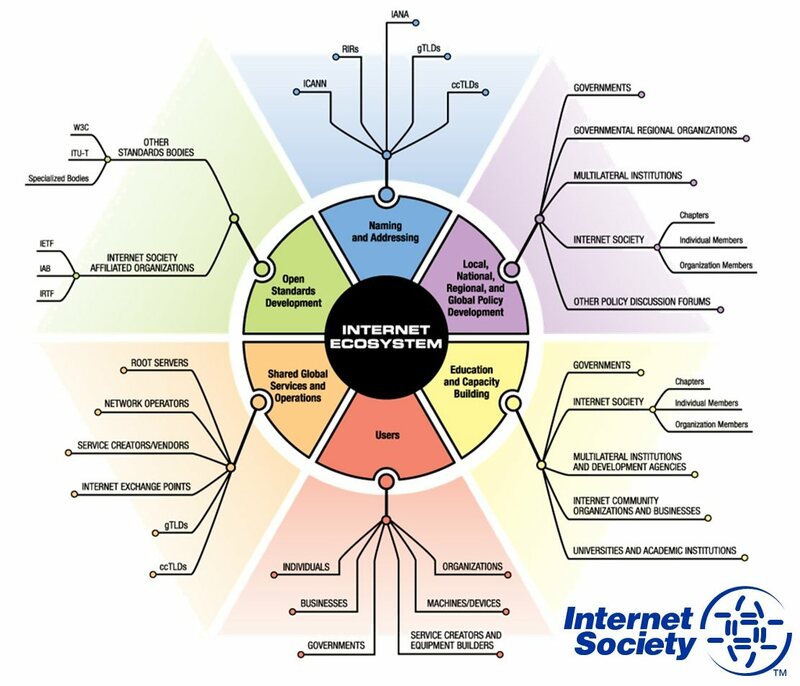 New bodies emerged, such as the Internet Society (ISOC) (isoc.org) in 1991 to promote the open development, evolution, and use of the Internet for the benefit of all people throughout the world. ISOC then chartered the Internet Architecture Board (IAB) (iab.org) which took on architectural oversight of the IETF?s work, and the Internet Engineering Steering Group (IESG) (iesg.org) which took on technical management of IETF activities and the Internet standards process. The IESG administers the process according to the rules and procedures that have been ratified by the ISOC Board of Trustees (Bradner 1996). In 1998 the IESG changed the basic form for all Internet Drafts to ensure that they contain a mandatory section under the heading ?IANA considerations?. In this section any required changes to the registries operated by IANA are formally stated and captured as part of the mainstream standards-making process. Similarly, the number of names also exceeded that manageable in a simple list file, and by 1993 were largely being registered by the company Network Solutions. In 1995 Network Solutions commenced charging for the registration of domain names, and this rapidly altered the incentives around Internet governance. In 2000, Verisign acquired Network Solutions, which at the time operated several gTLDs under agreements with ICANN ? as well as the overall root server containing the top level mappings between IP addresses and domain names. In February 2000, the NTIA entered into the first IANA Functions contract (NTIA 2000) with a purpose-built entity known as the Internet Corporation for Assigned Names and Numbers (ICANN), an organisation incorporated in 1998 as a Californian not-for-profit public benefit corporation. This original contract specified many basic corporate governance requirements, as well as technical and operational requirements for the conduct of IANA. The intention at this stage was that the NTIA?s role would diminish over time, and once the organisation was fully established the NTIA would withdraw completely (Chehade 2015). Since 2000, a series of RFCs have been created that more explicitly set out the relationship and performance standards of ICANN and IANA. Today IANA also performs additional functions on behalf of the global Internet community, such as maintenance of the Time Zone Database, but these are independent of the IANA Functions contract. The root zone continues to be operated by Verisign under contractual arrangements with both ICANN and NTIA. Two essential features of the Internet are those of cooperation and agreement, and this is embodied by the nature of IANA. There is no legal compulsion for equipment vendors, Internet Service Providers, or users broadly, to use IANA; however, without the consistency and coordination it offers, the Internet would clearly not have been the success it is today. Internet protocols rely on the uniqueness of the many identifiers at the core of operation. For example, where an IP address is used more than once, communications to the computer or device so designated cannot be reliably delivered. Where protocol identifiers are not unique, whole communications systems break down. The entire Internet is founded on these essential principles of collaboration. Thus it was that the documentary and administrative structures performed for and on behalf of the IETF were not formally recognised in contractual language until the late 1990s, as the technical approaches and methods were always determined by agreement and recorded in technical specifications ? the RFCs. As a result, the IANA functions can be viewed in two ways: as services to the IETF, and as activities performed under contract (ICANN SSAC 2014). Indeed in many legal jurisdictions the Memorandum of Understanding between the IETF and ICANN would be viewed as a form of contract; and certainly within the IETF community these services are well understood and the protocols for use well and truly the norm. Correspondingly, the RIRs possessed similar structures developed and documented over time. While IANA retains ultimate responsibility for the entire address pool, RFC 2050 (Hubbard et al 1996) recognises that RIRs operate under the consensus of their respective regional Internet communities, using open policy development frameworks (APNIC n.d). Common to the RIRs and to the IETF is that policy is discussed openly and transparently, and that decisions are taken on mailing lists in order to ensure the widest possible participation and therefore highest technical rigour. After the establishment of ICANN, names policy formulation also drew in larger groups of people and a range of working groups and bodies were created to recognise the different constituencies of use. ICANN is today a global multi-stakeholder forum comprising commercial entities, consumers, regulators and technologists. While the ICANN Board of Directors has the ultimate authority to approve or reject policy recommendations, three Supporting Organisations are responsible for developing and making policy recommendations to the Board and four Advisory Committees advise the Board. As of mid-2013, the Governmental Advisory Committee represented 125 nations (plus the African Union Commission, European Union and the Vatican). The Country Code Names Supporting Organisation represents more than 135 country code domains (ICANN Beginner?s Guide). Outside of the systems of Internet governance outlined above, increasing external pressures have mounted for further internationalisation of key Internet identifiers and the systems that surround them. Of particular note is that of the International Telecommunications Union (ITU), which has featured Internet matters on its agenda at its policy making forums ? most notably the World Conference on International Telecommunications held in 2012 (Wentworth 2012). As a treaty organisation, and part of the United Nations, the ITU operates under a strict system of membership and accreditation, with governments holding all the voting controls. A number of proposals placed before the ITU over the last few years have tried to give the ITU rights to allocate and manage the IP address space as well as other policy matters relating to the Internet?s function. To date, these have been steadfastly resisted by the Internet technical and policy community, largely on the basis that existing multi-stakeholder systems of Internet governance are inherently global in nature and have led to the open platform for permissionless innovation that we have today (Arrko 2013). The US Congress also passed legislation in November 2014 ?restricting the NTIA from using Federally-appropriated dollars to relinquish stewardship during fiscal year 2015 with respect to Internet domain name system functions? (Strickling 2015a). This means the NTIA may be prevented from accessing funds to terminate the IANA contract. With the contract due to lapse on 30 September 2015 this leaves the NTIA in a practically difficult position, but also a rather politically sensitive position, with parts of the US Republican Party taking a stance opposed to the transition. Furthermore, the NTIA stated that it ?will not accept a proposal that replaces the NTIA role with a government-led or an inter-governmental organisation solution? (NTIA 2014). In response to the NTIA announcement, ICANN convened a process which led to the formation of a representative organisation ? known as the IANA Coordination Group (ICG) (ianacg.org) ? to bring together a proposal for a future mode of operation and submit it to the NTIA. The ICG commenced work in July 2014 and comprises 30 representatives drawn from across the Internet community, including business, consumer and government representatives alongside the various technical constituencies. In September 2014, the ICG issued a request for proposals from the three operational communities comprising the direct customers of IANA, and directed this request to the IETF, the RIRs and ICANN. In true Internet fashion, each of these groups established open working groups using their existing processes to compile a response to the request, with both the IETF (Lear & Housley 2015) and the RIRs (Ng 2015) meeting the January 15, 2015 deadline. ICANN established a separate cross-community working group to bring a consensus proposal for the names function; however, that working group has predicted that it cannot produce a proposal until June 2015 (Dickinson 2015). 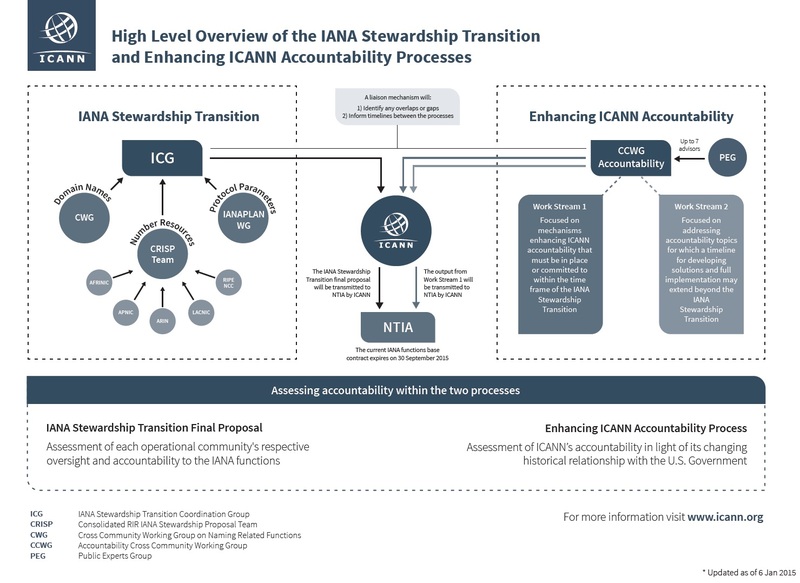 In parallel with the work to produce a proposal for a future mode of operation, ICANN continues its existing work to address internal accountability issues, as these measures address essential corporate governance issues that are required by the NTIA in order to undertake a transition. This work is also expected to be completed in June 2015. The NTIA will only consider a stewardship transition proposal alongside recommendations on how ICANN?s accountability can be improved. A significant amount of revenue is associated with the international domain name business. ICANN?s own revenue for FY 2013 was well in excess of US $200m. Individual domain names can be sold for hundreds of thousands of dollars, and new top level domains introduced recently have sold for as high as US$6.7m as in the case of *.tech. As a result much pressure has been placed over ICANN?s lifetime on its domain names policy decisions. Both the IETF and RIR transition proposals are clear in expressing their satisfaction with ICANN as the IANA functions operator. The IETF proposal essentially describes its current mode of operation and oversight; the RIRs? was similar, but with two distinct differences ? the RIR proposal calls for a new contract between ICANN and the RIRs; and for the movement of the IANA trademark and domain name iana.org to the IETF Trust, the legal entity holding intellectual property on behalf of the IETF under the auspices of the Internet Society. In this sense, both the IETF and RIRs are clear that while there is the intention to strive to ensure the continuation of the existing systems of Internet governance, there is the case of last resort where the IANA functions could conceivably be removed from ICANN either separately or as a whole. It must be stressed at this point that this case for separation is one not intended to be entered into lightly, but only in the case of complete and systemic breakdown of the operations to the point that they cannot be remedied. At the time of writing, a number of models were being discussed in the names community, with both internal and external options for structural separation of IANA and ICANN being mooted (Kuerbis 2015a; 2015b). These discussions are ongoing. Despite this, there does appear to be strong community support for a transition to occur within the near term (Strickling 2015b). Should these proposals fail to converge on a single operating model before the 30 September 2015 deadline, the NTIA has the option to renew the contract for a two- or four-year period, or for some other specified period, such as a precise term within which to implement a transition. Given the increasing pressure for globalisation from other governments and a confident Internet policy community, it is likely that the US government will relinquish its singular role in the stewardship of key Internet functions in the near term. The potential for failure is also high, however, in that the US Congress may seek to politicise the transition as it moves into its next election cycle. Thus if the Internet community dithers ? whether in the attempt to produce a perfect system of governance, or by failing to produce an effective model satisfying both the Internet community and the NTIA ? then the opportunity may pass for at least another four years. Should the opportunity be missed then we can all expect renewed and increasingly vigorous attempts at taking control of Internet naming, numbering and protocol identifiers by other players in the telecommunications landscape. This latter outcome can only lead to a reduction in trust and continuing pressure on the stability of the overall system. The Internet is successful in large part due to its unique model: shared global ownership, open standards development, and freely accessible processes for technology and policy development. The Internet?s unprecedented success continues to thrive because the Internet model is open, transparent, and collaborative. The model relies on processes and products that are local, bottom-up and accessible to users around the world. Governments Federal, State and local governments and their regulators have roles in setting policies on issues from Internet deployment to Internet usage. Governmental Regional Organizations Governmental regional organizations include, but are not limited to, the African Union, the Asia-Pacific Economic Cooperation (APEC), the Asia-Pacific Telecommunity, the Caribbean Telecommunication Union (CTU), the Commonwealth of Nations, the European Union (EU), and the Inter-American Telecommunication Commission (CITEL). Governments sometimes like to coordinate policies related to the Internet for their regions. Internet Community Organizations and Businesses Many Internet organizations and businesses encourage, train, and invest in Internet education and capacity building. Organizations include, but are not limited to, the RIRs, ICANN, regional and national network operators, and the Network Startup Resource Centre (NSRC), as well as vendors such as Afilias Limited, Alcatel-Lucent, Cisco, IBM, and Microsoft. Internet Exchange Points (IXP) Regional and national IXPs provide physical infrastructure that allows network operators to exchange Internet traffic between their networks by means of mutual peering agreements. Multilateral Institutions and Development Agencies Multilateral institutions include organizations that have multiple countries working in concert on Internet issues for policy development, education and capacity building. Organizations include, but are not limited to, the International Telecommunication Union (ITU), the ITU?s Development Sector (ITU-D), the United Nations? UNESCO, and the World Intellectual Property Organization (WIPO). Network Operators Network Operators include companies that provide access to the Internet. Regional Network Operator Groups (NOGs) provide collaboration and consultative opportunities for local operators and among NOGs globally. Other Policy Discussion Forums Organizations include, but are not limited to, the Internet Governance Forum (IGF) and the Organisation for Economic Co-operation and Development (OECD), as well as national consultative forums, industry associations, and civil society organizations. Service Creators/Vendors Service Creators and Vendors provide software applications and experiences that utilize the Internet. Specialized Standards Bodies Many organizations focus on specialized standards; some play key roles in the Internet. These organizations include, but are not limited to, the European Telecommunications Standards Institute (ETSI), the Identity Commons, the IEEE Standards Association, the ISO ANSI, the Liberty Alliance Project, Open Source Communities, and the Organization for the Advancement of Structured Information Standards (OASIS). Universities and Academic Institutions Historically and continuing today, academic institutions play a critical role in educating students and business people. They also prototype and demonstrate hardware and software solutions that benefit the Internet. Users People and organizations that use the Internet or provide services to others via the Internet. The Internet Society is a non-profit organization founded in 1992 to provide leadership in Internet related standards, education, and policy. With offices in Washington, D.C., and Geneva, Switzerland, it is dedicated to ensuring the open development, evolution, and use of the Internet for the benefit of people throughout the world. More information is available at: http://InternetSociety.org. Meyer, E. 1970. Network Meeting Notes. Retrieved from http://www.rfc-editor.org/rfc/rfc82.txt. [i] For ease of use, both IP addresses and autonomous system numbers are referred to herein as IP numbers.